"I know he has been subjected to utterly ridiculous bans and deletions on that obviously biased social interaction site. If Facebook keeps up the liberal censorship and arbitrary punishment of conservatives and creationists, it could lose the market share. It is only a matter of time before another site would step up to take their place. Remember, it didn't take long for FB to make Myspace obsolete." I have two aspects that I want to discuss here. First, overall Internet safety guidelines and Facebook. Second, Facebook's blatant discrimination and bullying against political Conservatives, conservative Christians, and biblical creationists. Facebook has changed over the years. Along with other social media, they grab the rights to use your photos. But the rules change frequently, so that could be outdated and modified already. One problem is that Facebook requires people to use their real names and information. The reason that is a problem is that it is a privacy concern, and haven of identity thieves. An article on safety for young people makes sense for everyone. More than that, Facebook is not your friend. They want too much information. Do not give it to them. Although the powers at Facebook don't like it, people use fake names (many obviously fake, even obscene) on Facebook all the time, and have multiple accounts. For some, the only possible reason for them to exist is to be offensive. The drawbacks are that your friends cannot find you unless you tell them ahead of time. "Yes, my name is John Jacob Jingleheimer Schmidt. Look for me under Jim Smith, here's the e-mail address that I used when I signed up, search for that..." Another drawback is if Facebook catches on and says, "We think this is a fake account. Verify your name". Then you activate your auxiliary account. Which can be a hassle if you have 500 "friends" and need to make contact all over again, convincing them that yes, it's really you under this other name. Hopefully, you used the link under "Account Settings" and backed up your information so you can keep your photos, friends list and so on. Ironically, this was posted on Facebook. 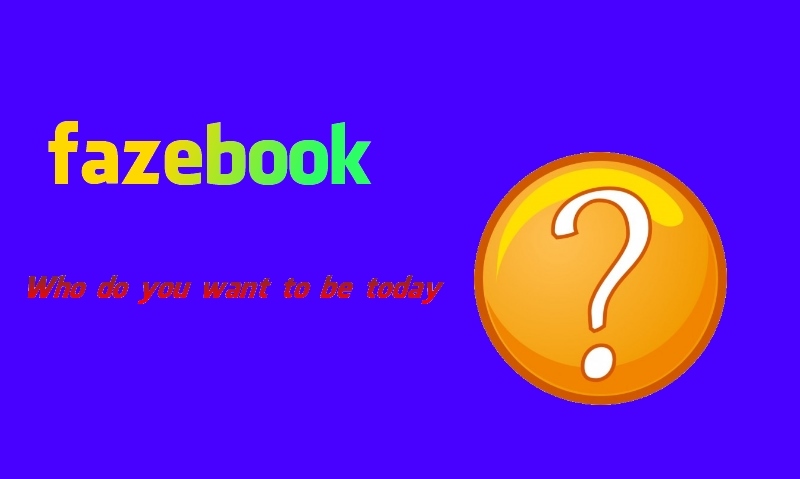 Parody of both Facebook and the old Microsoft slogan, "What do you want to do today?" You have to weigh the advantages and disadvantages for yourself. No matter what, I strongly recommend that you "lock down" your settings to at least "friends only". This includes your friends list. I don't think anybody needs to know who your friends are. Even other "friends". Some people will "friend up" almost anybody, and I think that's not such a good idea. You can get spies or pretenders. Play it safe, people! Identity theft, fake friends, stalkers and so on. Think about it. And now, the discrimination of Facebook. More than a few of us are becoming increasingly exasperated with the increasing bigotry, discrimination and hypocrisy of Facebook. It is without legitimate cause. As Radar said in the quote at the top of the page, this can backfire and Facebook can lose market share. 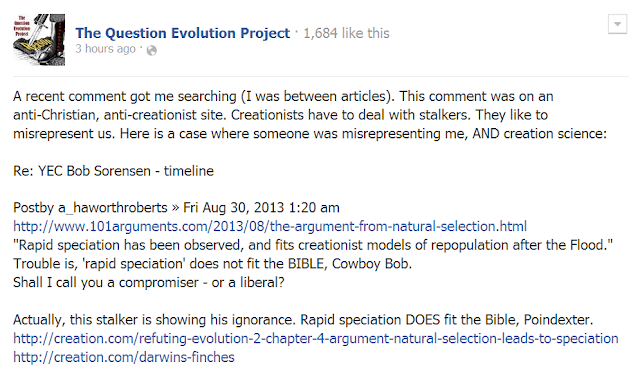 One Admin on "The Question Evolution Project", under his own name, quoted an atheist and said something to the effect of, "Nice bit of prejudicial conjecture". The poor persecuted victim complained, and the Admin was given a 12-hour ban on posting, even though his comment violated none of their "standards". The next day, in an unrelated incident, another Admin was given the same penalty for disputing with an atheopath and showing the errors of his logic. We agree that if we foul up and deserve punishment, we'll "man up" and take it. But not this injustice. This kind of nonsense happens to individuals as well as Pages. 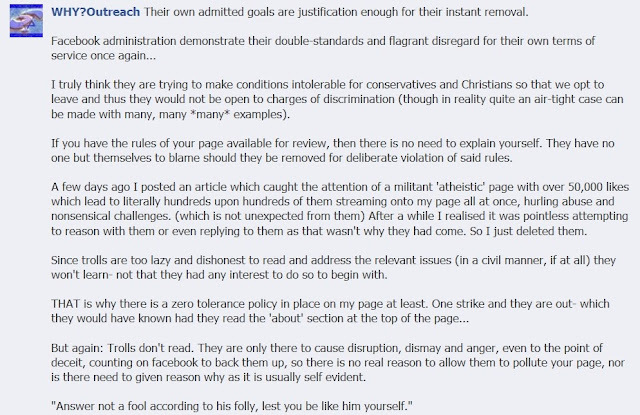 Of course, if atheist-run Facebook wasn't so blatantly discriminatory and hypocritical, such things would not be needed. Naturally, the secularists will say, "No, it's not true", even though Christophobes and leftists are getting away with filthy content, and some names are too shameful to even write down. Edit: Hatetheists attacked me for this post, ignoring the pertinent material and instead ridiculing things that were never said. These are the kinds of people to keep out of your stuff. I believe that quite a few people are going to jump ship when a new social media service comes along with decent features, is consistent in applying its rules and won't steal your stuff. Too many modern atheists and pretend agnostics are more intent on ridiculing Christians (especially creationists) than in simply going on about their business. It's been rightly observed, though, that if an atheist sees a gang of young men coming toward him, s/he will breathe easier if they're carrying Bibles. Screen shots are "Fair Use" for educational purposes. Also, Twitter's "Tweets" are public. To display their intellectual prowess, some want to engage in "debates". I said "debates" because they do not like structured, moderated debates, but prefer a free-for-all where changing the subject, bad logic and abuse are their modus operandi. I have noticed that, with the exception of Internet public debate forums, when Christians are doing their own thing, atheists jump in and start raising a fuss. (Sometimes, they even pretend to be Christians in order to infiltrate groups set up specifically for Christians.) When they give the "I'm so much smarter than you st00pid dumb Xtians" nonsense, most will back off from debate challenges, especially about creation and evolution. Perhaps it is because they know that creationists win those debates. Most just want to express hate. And God forbid (heh!) 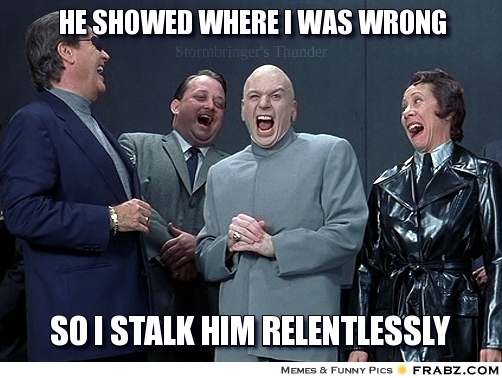 that someone dares to express an unflattering opinion of an atheist stalker bully. When challenged, they play the victim card. Some are even outrageous enough to lie and say that they are being persecuted, but in fact, they are the ones doing the persecuting. 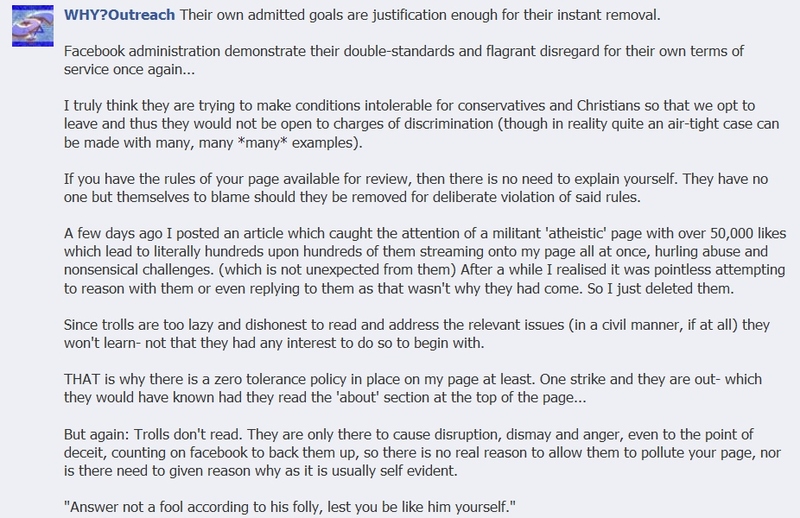 (Persecution and discrimination from atheists has been shown on this Weblog many times.) I have seen them remove their comments or threads (including comments that were removed from this Weblog when someone realized what a fool he was making of himself, back when I accepted comments). The few atheists who want to go on about their business and will discuss their views, or not, seem to be dwindling. Apologist Jason Petersen has had some debates, but does not give in to the "free-for-all" verbal debates where it is one against many on a Skype call. Yeah, sounds fair, huh? He does written debates. 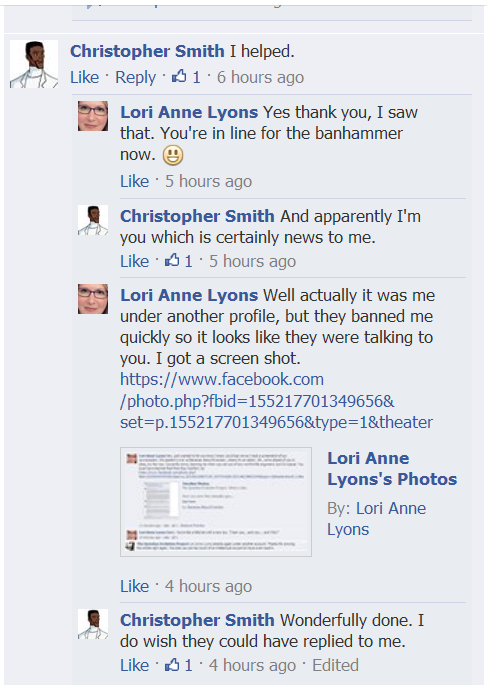 When some of these cyber bullies lose the debates, they attack the person and even begin stalking as well as libeling. I know the feeling all too well. Methinks his "name" is already rubbish, as evidenced by his documented antics. Jason has some experiences to relate with dishonest bullies. First, "More Examples of How Some Unbelievers Value Ridicule Over Honesty", followed by "More Examples of How Some Unbelievers Value Ridicule Over Honesty Part 2". The latest installment is "An Informal Debate with Some Atheists". He has some links embedded to further document his accounts. A recent article by an atheist is getting some attention. He does not appreciate the actions of his brethren. I'll come back to this later. Several times in the past, I have documented my experiences and observations, and those of others, regarding militant atheists. 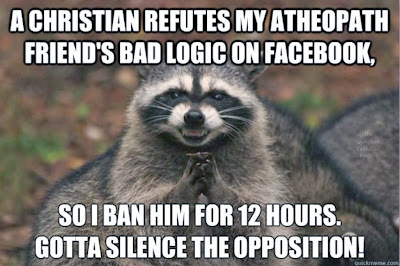 Interestingly, they play the victim by saying that Christians persecute atheists! That is the opposite of the truth 1, 2, 3, 4, 5. Christians are defenders of the rights of people to believe (and disbelieve) without coercion to convert. When I inquired of others about the "old days" of my experience, when most atheists were "live and let live", with an attitude of, "I do not believe, you do, we can discuss it or not, whatever", some people say that they are like Muslims: Nice at first, but when they gain power, watch out. And don't you dare question evolution! There were not many atheopaths in my experience in the early 1970s, but I remember Scott. He was a pseudo-intellectual attention whore, bragging about his alleged suicide attempts and reading Nietzsche. One time, he ranted that all Christians should be burned at the stake. Strong talk for a nutty 15-year-old, but I pretty much wrote it off; he was no threat to anyone. Images are "Fair Use" for educational purposes. In all this, many modern militant misotheists maintain that they stand for "reason" and "logic", but do precious little to successfully engage in those activities. Atheist Brendan O'Neill wrote an article for The Telegraph, expressing his own displeasure. He has some interesting insights. This week we've been treated to new scientific research claiming to show that atheists are cleverer than religious people. I say scientific. I say research. It is of course neither; it's just a pre-existing belief dolled up in rags snatched from various reports and stories. Not unlike the Bible. But that hasn't stopped the atheistic blogosphere and Twitterati from effectively saying, "See? Told you we were brainier than you Bible-reading numbskulls." I don't know if Mr. O'Neill claims to be unbiased like many other atheists, but his bias shows up here. So, what’s gone wrong with atheism? The problem isn’t atheism itself, of course, which is just non-belief, a nothing, a lack of something. Rather it is the transformation of this nothing into an identity, into the basis of one’s outlook on life, which gives rise to today’s monumentally annoying atheism. The problem with today’s campaigning atheists is that they have turned their absence of belief in God into the be-all and end-all of their personality. Which is bizarre. Atheism merely signals what you don’t believe in, not what you do believe in. 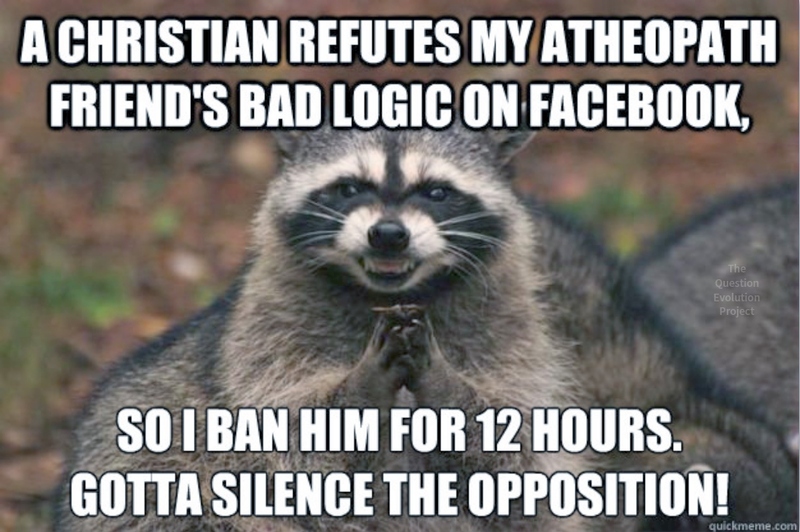 He is on the right track, as I have seen too many Christophobes on their anti-God jihads, making their alleged "lack of belief" their reason for being. 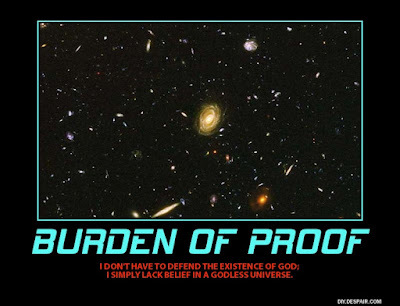 The "lack of belief" thing is a cop-out. The real, established definition of atheism is a denial of the existence of God. O'Neill has some flaws, but his exasperation with many other atheists is understandable. Some just want to go about their business, but too many others are reinforcing the public opinion that atheists are the least-liked, least-trusted group in America. And probably many other places. Take a look at his article and see.